BackOFF™ Brake Hold Module - AdventureTech, LLC. The BackOFF™ Brake Hold Brake Light Module detects your speed and automatically turns your brake lights on when you are stopped or stopping/slowing down - allowing you to keep both of your feet and hands free. Connects to your electronic speed pick-up sensor (will not work with cable driven speedometers) to keep your brake lights on when you release your brakes but are still decelerating or stopped. Whether you're stopped and resting or coasting to a red light your rear end visibility is greatly increased by the brake hold module, as it will illuminate your brake lights while you're not compressing your brakes. During installation you'll have 2 different brake light flash patterns to choose from (listed below). This module is designed to work with standard incandescent brake lights, LED brake lights, or a combination of both. Note: This module is rated at 10 amps which can generally drive up to (3) standard bulbs. If the Brake Hold Module is holding your brake lights on for you and you wish to gain the attention of someone behind you; simply tap your brakes and your brake lights will flash 5 times then return to steady on. This alert feature is useful if you see someone approaching quickly behind you and you want to make sure you're seen. These flash patterns are not random, but have been selected because of their ability to gain and retain following driver's attention. Most states drivers handbooks recommend that you flash your brakes when slowing or stopping. The BackOFF™ Brake Hold automatically facilitates compliance and enhances safety. 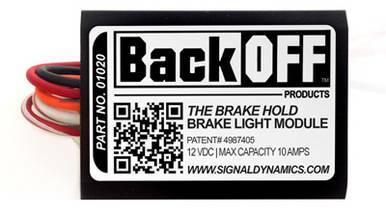 Install the BackOFF™ Brake Hold and see how much more effective your brake light can be!